Cardiac arrest on ECMO… Does it still count? The emergency alarm goes off in the ICU and you are the first doctor to arrive. The patient is a 45-year-old man transferred to the unit and started on extracorporeal membrane oxygenation (ECMO) two hours prior. Q1. What is the first thing you should determine if a patient arrests on ECMO? The first thing to establish is whether the patient is on VA or VV ECMO. Q2. You establish that the patient is on VA ECMO and has had a cardiac arrest, what should you check next? The next thing to check is the ECMO circuit flow and the blood pressure. If the circuit flow is able to maintain systemic perfusion (e.g. >4L/min) then you have time to think! Pump failure – the ECMO machine will have stopped, clamp the circuit, transfer to the emergency drive unit (the “hand crank”). Check the power supply; you may need to exchange the ECMO unit. Decannulation or circuit rupture – this will be self evident and messy, clamp the circuit and turn off the pump to prevent further air embolism or exsanguination, apply pressure to any bleeding sites, then manage the patient as per ALS – emergent recannulation. Air embolism – clamp the circuit on the return line and turn off the pump, position the patient head down and manage as per ALS, consider aspirating the right atrium and/or right ventricle. Fulminant circuit or pump head thrombosis, clamp the circuit and manage the patient. Q3. Should you do chest compressions for cardiac arrest in a patient on VA ECMO? This depends on whether the ECMO circuit is still perfusing the patient. If the circuit is maintaining systemic perfusion then you do NOT need to perform chest compressions. Even brief periods of low flow can usually be tolerated. If there is pump failure, switch to the hand crank immediately. If there is no circuit flow (see above), then you should manage as per ALS guidelines until ECMO flow is re-established. Adrenaline boluses in the minutes before ECMO support should be avoided. Q4. What will the arterial line show in a VA ECMO arrest? There will be a loss of arterial pulsatility due to a loss of native cardiac output. This will result in an arterial “flat line” trace and the mean arterial pressure (MAP) will likely drop depending on amount of ECMO support and the patient’s total peripheral resistance. Q5. What rhythms would you expect to see? The rhythm may be a non-shockable or shockable rhythm. Non-shockable rhythms are asystole and pulseless electrical activity (PEA). Shockable rhythms are ventricular fibrillation (VF) and ventricular tachycardia (VT). 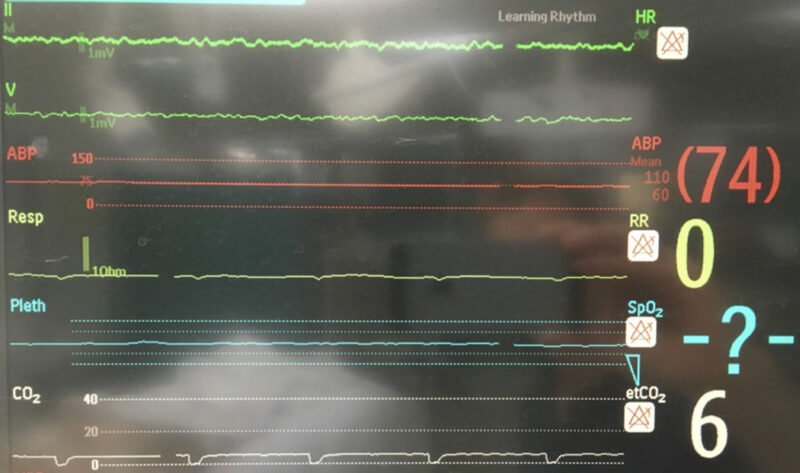 Monitor showing ventricular fibrillation in a patient supported by VA ECMO. Side note: Is a PEA arrest on ECMO a “thing”? These are patients with loss of native cardiac output or various degrees of cardiogenic shock. The term PEA whilst technically correct is generally not used in these circumstances ,instead we talk about loss of pulsatility secondary to poor native cardiac output or poor aortic valve opening that results in an undetectable pulse. If the patient has severe cardiogenic shock they may not have a palpable pulse or even visible pulsatility on their arterial line trace. Whilst this would technically fit the definition of PEA, an echo may actually show some cardiac movement. In this setting loss of pulsatility reflects severe heart failure rather than an arrest. Increasingly the term “pseudo-PEA” is being used for cases such as this, where true “electro-mechanical dissociation” is absent. Q6. What are the treatment priorities in a cardiac arrest in a VA ECMO patient? There is no universally standardised approach for these patients with mechanically supported circulation. In particular adrenaline boluses are NOT indicated. Ensure that support with VA ECMO is adequate. Get help! Ensure the ICU Consultant and ECLS Coordinator are notified ASAP. Decrease lung ventilation (pulmonary blood flow is usually minimal). Required respiratory rate may typically be 2-4 breaths per minute during cardiac arrest on VA ECMO. 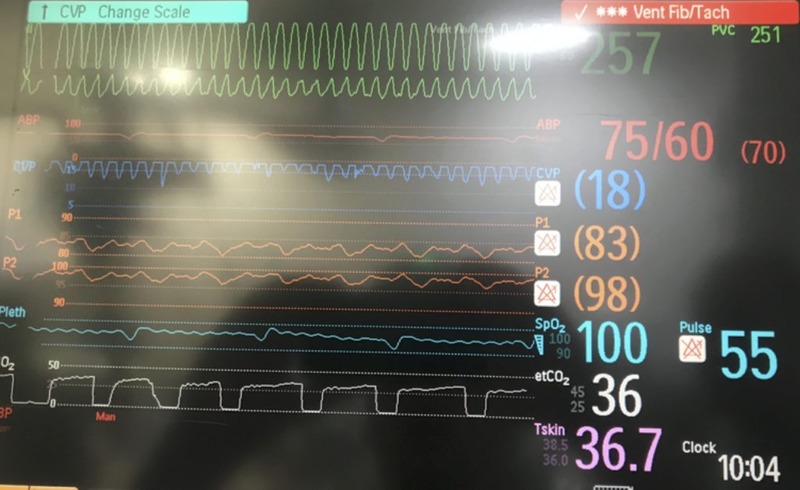 Note that it is possible for a patient receiving VA ECMO to be awake, at least to some degree, during a cardiac arrest… which can have important management implications! Always consider the need for explanation and the need for analgesia and sedation before administering uncomfortable therapeutic interventions. Q7. What can cause an arrest on VA ECMO? focused transthoracic echocardiography (TTE) initially, transoesophageal echocardiography (TOE) TOE if indeterminate and patient is sufficiently stable. Q8. What complication may occur with loss of native cardiac output, even if the patient is fully supported on VA ECMO? A lack of forward blood flow through the left ventricle has resulted in stasis of blood in the left ventricle. Thrombosis occurs when forward blood flow and aortic opening is not restored in a timely fashion. This complication is usually catastrophic. Prolonged impaired pulsatility can also lead to progressive left ventricular distention and potential for aortic regurgitation, which can cause acute pulmonary oedema and render VA ECMO support ineffective.